“Not long after I took up fly fishing, as a teenager, I began to look upon those who fished the Royal Coachman and Parmachene Belle and other such garish and unnatural flies as…well, gullible. When I’d hear chatter about the magic of red floss and peacock herl in the Royal Coachman dry fly I’d just smile a sympathetic smile of wisdom. Oh poor, ignorant fools, I’d think. As we can surmise from Skip Morris’ comments above (Thanks Skip! ), attractor dry flies have been around a long time…and have been looked down upon by many an “ignorant fool” over the years. On a more positive note, many of us- mainly through the teachings of great tyers/authors like Morris, LaFontaine, Swisher, et al.- have found out how effective these great flies can be…even here in the Driftless. So, what are some good attractor dry flies to use on Driftless Area streams and rivers? That list would be a long one, so I’ll highlight a few I’ve used, and a few that have been mentioned by other folks on the MN Trout Forums board. First on my list…mainly because it is probably the first attractor dry I ever used…is the Yellow Humpy. I’ve caught many trout on this fly, which has its origins in the Rocky Mountains, but catches fish here, too! The Grizzly Wulff is a similar fly that I’ve used with success as well. Of course I must mention my own creation, the Slurpster. Obviously the intellectual progeny of the Madam X, this fly has proven to be a very effective and quite durable fish catcher. This has been my “secret weapon” for around a decade now, and I’ve just recently declassified it. Trout typically take this fly with a slow SLURP, and the rises are often dramatic. Makes for fun fishin’! I tie this fly in tan, olive and black, with black being my favorite. Can you see the Slurpster? As I said, there are many great attractor dries that can be very effective on our local streams. Other local fishermen have had great success with the following patterns: Stimulators (many different flavors! ); Royal Wulff; Pass Lake Dry; Clown Shoe Caddis; Royal Caddis, and other homebrewed patterns yet to be made famous. So now we have an idea on what flies to use, now how about when, where and how? Well, there are no hard and fast rules on any of these, so I will simply describe what has worked best for me over the years. When: I typically start having good luck on attractors around the end of May. By this time, there typically has been some major hatches of various caddis and mayflies, and terrestrial insects are active. All this adds up to trout being more prone to “look up” for their food. Good fishing on attractors will last throughout the entire remainder of the season…even in the “dog days” of summer. Time of day: I’ve had good luck at pretty much any time of day, although the best times are of course the best times for any type of fishing: morning, evening, and overcast days. I do remember going out very early one morning (on the water right before dawn) and finding many fish rising. I could catch virtually all these rising fish on a Slurpster. They would take it without hesitation. What a great morning. How: It’s been my experience that large patterns like the Slurpster and the Madam X fish best on a dead drift with no hint of drag. It often happens that trout follow these patterns for several feet as they drift along before deciding whether or not to take. 9 times out of 10, when the fly starts to drag, they turn away (see big fish memory above). Long drifts aren’t always necessary, but I’ve been surprised more than once by a trout that takes the fly after it has drifted for long time and I’m about to pick up for another cast. 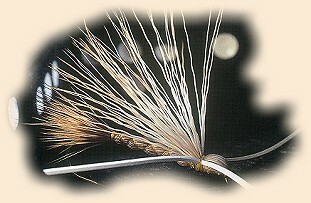 Smaller, bushy hackled flies like the Humpy, Stimulator, etc., can be fished dead drift, but twitching or skating them can also lead to some violent strikes and more takes. My guess is that these patterns look more like some kind of hatching insect, and so giving them “life” can be an effective method. This entry was posted in Uncategorized on June 1, 2014 by Brian Stewart. Great posts here, Brian, thanks!